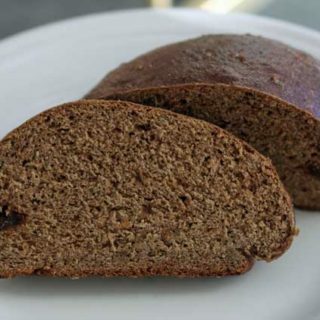 A traditional Russian black bread made with bran cereal, rye flour, instant coffee, unsweetened chocolate, fennel and caraway. I used Raisin Bran and really liked the extra sweetness from the raisins. 1 teaspoon cornstarch dissolved in 1 tablespoon of cold water. Combine the rye and white flours. Put 2 cups of the flour mixture in the bowl of a stand mixer. Add all the remaining dry ingredients and stir well. In a saucepan, combine water, vinegar, molasses, chocolate and butter and heat until chocolate melts, stirring often. Let the temperature cool down to 125 degrees F , then add to the dry mixture in the bowl. Stir well, then gradually add remaining flour mixture until you have a soft dough. If you weighed the flour, you will probably need all of it. Conversely, if for some reason your dough is too sticky, you may need a little more. It should just barely pull away from the side of the bowl as it is being kneaded. Put the mixing bowl on the stand, attach the dough hook, and let the machine knead for 10 minutes. Turn dough into an oiled bowl and let rise until doubled in bulk (about an hour). Cover bowl and let rise in a warm (100 degree F) place. When dough has doubled, punch it down and shape into two balls. Place each ball in a greased 8 inch round pan. Let rise until doubled (about 30 minutes). Bake the loaves in a 350 degree oven for about 45 minutes. When the bread is almost done baking, begin making the glaze. To make the glaze, bring 1/4 cup water to a boil. Add the dissolved cornstarch/cold water mixture and boil until thickened. Brush this over the baked bread.